With the work i did today (which i will write about soon) on the Laser Competition i used this knot to attach the side guy lines. In fact it's a combination of a Figure Eight and a Lark's head or (cow hitch). 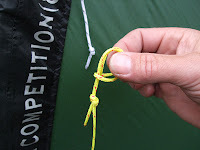 I know this knot from making Kites, and in the world of Kiting it's very well known for attaching the steering lines to the kite lines very fast and easy. And this is quite special because when the kite lift me up or drags me around over the sandy beach the forces on the knot is very great but still it will come of very easy. 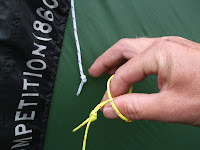 In the world of backpacking and hinking this knot is not very well known, at least that what i think when i see lightweight hikers on you-tube fiddeling around with their tarps and guy line setups. 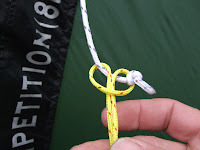 While te uses of this knot are plenty. 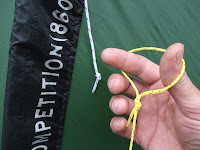 For Example; A tarp shouldn't have loops, but small ropes with Figure Eight on the end. 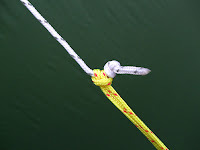 A guy line with a loop at the end can attach or deatached to any of those small ropes within 5 seconds. I have made some photo's so you can see how easy it is. Within seconds a guyline is attached or detached. In this case i use it on the Laser Competition because the line must be detached for the hood to put it on or for it come of.